Building engaging Actions for the Google Assistant is just the first step in your journey for delivering a great experience for your users. We also understand how important it is for many of you to get compensated for your hard work by enabling quick, hands-free transactional experiences through the Google Assistant. Let's take a look at some of the best practices you should consider when adding transactions to your Actions! Our new Google Sign-In for the Assistant flow solves this problem. By implementing this authentication flow, your users will only need to tap twice on the screen to link their accounts or create a new account on your website. Connecting individual user profiles to your Actions gives you an opportunity to personalize your customer experience based on your existing relationship with a user. And if you already have a loyalty program in place, users can accrue points and access discounts with account linking with OAuth and Google Sign-In. Head over to our step-by-step guide to learn how to incorporate Google Sign-In. Most people prefer to use the Google Assistant quickly, whether they're at home and or on the go. So if you're a merchant, you should look for opportunities to simplify the ordering process. Choosing a product from a list of many dozens of items takes a really long time. That's why many consumers enjoy the ability to quickly reorder items when shopping online. Implementing reordering with Google Assistant provides an opportunity to solve both problems at the same time. Reordering is based on the history to previous purchases. You will need to implement account linking to identify returning users. Once the account is linked, connect the order history on your backend and present the choices to the user. Just Eat, an online food ordering and delivery service in the UK, focuses on reordering as one of their core flows because they expect their customers to use the Google Assistant to reorder their favorite meals. Once a user has decided they're ready to make a purchase, it's important to provide a quick checkout experience. To help, we've expanded payment options for transactions to include Google Pay, a fast, simple way to pay online, in stores, and in the Google Assistant. Google Pay reduces customer friction during checkout because it's already connected to users' Google accounts. Users don't need to go back and forth between the Google Assistant and your website to add a payment method. Instead, users can share the payment method that they have on file with Google Pay. Best of all, it's simple to integrate – just follow the instructions in our transactions docs. 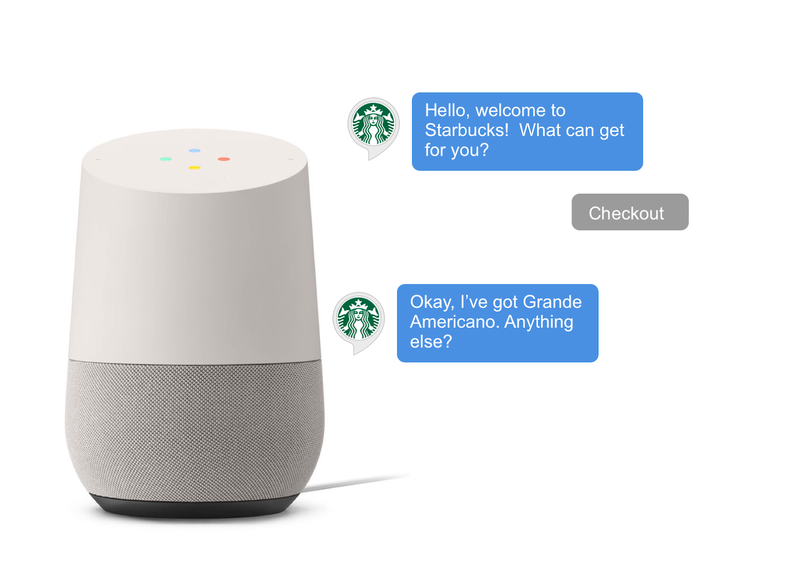 At I/O, we announced that voice-only transactions for Google Home are now supported in the US, UK, Canada, Germany, France, Australia, and Japan. A completely hands-free experience will give users more ways to complete transactions with your Actions. Build easy-to-follow dialogue because users won't see dialogue or suggestion chips available on phones. Avoid inducing choice paralysis. Focus on a few simple choices based on customer preferences collected during their previous orders. Localize your transactional experiences for new regions – learn more here. Don't forget to enable your transactions to work on smart speakers in the console. Learn more tips in our Conversation Design Guidelines. As we expand support for transactions in new countries and on new Google Assistant surfaces, now is the perfect time to make sure your transactional experiences are designed with users in mind so you can increase conversion and minimize drop-off.